RCBS suprized me a little! Thread: RCBS suprized me a little! 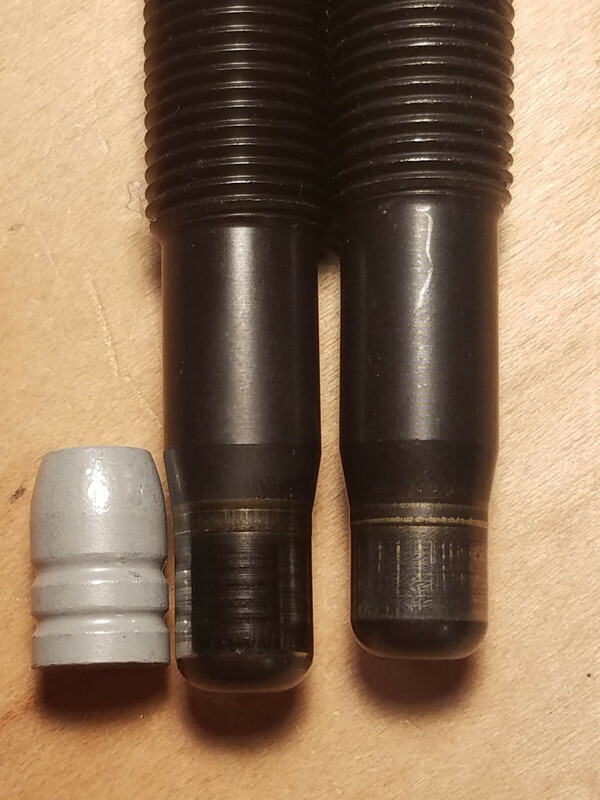 I am starting to load for cast boolets in a Henry .357 Max, and I posted a question to their 'tech people' asking about using a cowboy expander in a standard carbide die set, to get a larger neck for my .358 cast? They didn't reply to my question, just sent me a new cowboy expander stem, marked ' damaged part replacement', free of charge. When I didn't hear back from they I ordered same from Midway USA. With my cheap digital caliper, the cowboy expander measures about .358/9, and the orginal about .001 less. May have to sell one? That's service! Just received a ram pin for my 1969 Rock Chucker from RCBS. Free and quick. 60 years old and they still care. A few years ago, I called them to ask for a part number for expander plug assemblies that would work in the 10/40 for cast. My intent was to order them, but unsure what to buy. Being unsure himself, the gentleman sent a couple different sizes to try. For free. By the way, the expander plug you want for the 10mm is the Cowboy expander assembly for the 38-40 WCF. Stamped "401 Cowboy". The shank is a little long for 40 S&W since it plunges into the part of the case where it gets thicker. I had a buddy machine a little bit of length for the 40. The shank, as-is, is perfect for the bearing surface of 180 and 200 grainers in the 10mm case. The 401 Cowboy M expander is left. The standard 40/10 M expander is right. Back in the early 80's I got into reloading with a Pacific 007 single stage kit. A few years ago, the clear tube on the powder measure had gotten black, hard, and disintegrated. so the lady at customer service said they'd just send it at no charge. so I asked if it'd be OK to donate $20 to the NRA in their name. We were both happy with that. RCBS is a great company with great products! RCBS did the same for me. I needed a cowboy die expander for my standard die as well.I called them and told them I would like to buy one and the lady said that she would have one in the mail that day at no charge. The FEW times I have had problems with RCBS, it was replaced no questions asked. A life long fan of the green machine. You had better service than I did....Read Loading 44 special. I bought a set of 45 acp dies off the forum here. They were missing the bullet seating stems. So I called RCBS and told them I needed both a round nose and flat stem for dies I bought used, they refused payment and sent them for free. RCBS and Dillon both have well earned reputations. It’s good to hear that Hornady and Redding are stand up companies too. I don’t own any Hornady and have not needed help from Redding, yet! RCBS has helped me every time I had a part issue. And usually free too. I've had two issues crop up with RCBS products over the years that were due to just normal wear and tear and RCBS never charged me a dime for replacement or parts. Their service is absolutely outstanding which makes me such a loyal RCBS fan! I have 2 for you. I called RCBS about a primer spring for a piggyback and the nylon bushing. They sent 4 bushings and a spring that is better then the original. Called them warranty items. Contacted Henry Rifles about a replacement front sight hood for one of their older 22 levers that my grand son got from my FIL. Also asked about a printed manual and ask them to invoice me. I got both items no charge. Pretty good people to work with. Maybe you talked to the wrong person.Try again.Seriously. The Green Machine was the reason I stopped buying RCBS stuff for decades. That was a $400 mistake. And before you few guys who use the darn thing pile on...I know you can make it work - sorta kinda - if you prime off the press. Rcbs has the absolute best customer service i have ever seen. RCBS and Dillon. They rule the roost in my personal experience. In the past 40 years, there have only been 3-4 times I've ever needed anything from either of them. They came through with flying colors every time. Two years ago after many thousand of rounds loaded on my Dillon 550B, it was in need of some attention. I sent it off with payment for a refurb and what came back (quickly I might add), shocked me. I'm 99.99% sure they just replaced my old one. The only thing I could see that didn't look brand new, was the platen on top of the ram.